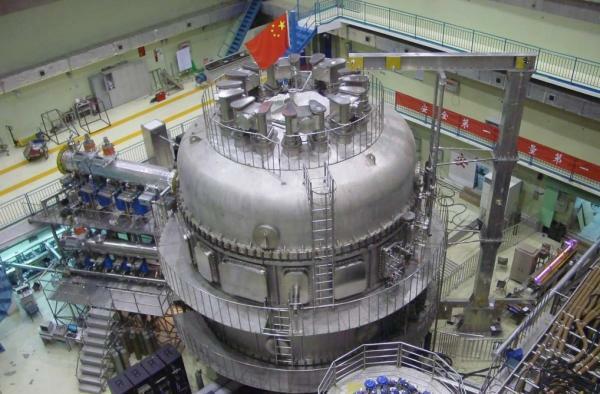 China's Experimental Advanced Superconducting Tokamak (EAST) made an important advance by achieving a stable 101.2-second steady-state high confinement plasma, setting a world record in long-pulse H-mode operation on the night of July 3rd. The obtained high confinement mode features edge-localized modes (ELMs) with small perturbation amplitude under the condition of low-momentum injection with pure RF (LHCD, ICRF, ECRH) wave heating, and an actively cooled ITER-like monoblock tungsten divertor. With effective control of the divertor target heat load and tungsten impurity influx, and the center chord average electron density maintained at > 50% of the Greenwald density limit, EAST achieved a fully non-inductive, current-driven, steady-state plasma with a confinement enhancement factor H98y2 greater than 1.1 for more than 100 seconds. All the plasma parameters, including recycling, and particle and heat fluxes, reached a truly steady state after 20 seconds—the wall saturation time for the W divertor—and remained stable until the end of the discharge. Chief Operator GONG Xianzu shared the good news and his excitement with some EAST partners at home and abroad at midnight via social media. GONG has witnessed every advance made on the machine as well as its setbacks, since his first operation of EAST in 2006. This breakthrough, he said, indicates EAST will "continue to play a key role in both the physics and engineering fronts of steady-state operation, and has significant scientific implications for the International Thermonuclear Fusion Reactor (ITER) and the future China Fusion Engineering Test Reactor (CFETR)." "It is a success based on joint efforts," said GONG. The EAST team has worked together with collaborators at home and abroad over the past decade to solve a series of key technical and physical issues closely related to steady-state operation, and carried out in-depth scientific research on integrated operation scenarios with effective coupling of multi-scale physical processes. The EAST 2017 experimental campaign will go on for about one more month; the second round of experiments will start in autumn of this year.